Connect Windows computer directly to sensors: . The i60x is a tiny standalone USB device with 8 channels; whereas the larger i555 involves an 8 to 256 channel card cage with optional anti-aliasing filter. The i601 is the smallest and most accurate electrically-isolated 8channel direct-to-sensor data acquisition system in the world. For i60x accuracy specifications, click here. Why so accurate? It was designed in 2016; whereas many competing products are older. For full datasheet, click here. The i601 provides ±36V bank electrical isolation; whereas the less costly i600 directly connects I/O signal ground to computer ground via USB cable. Extremely accurate 24-bit A/D Converter29. Compatible with LabVIEW, DASYLab, MATLAB, Origin, C and Visual BASIC Software. Digitize channels at up to 166,000 samples per second aggregate. Compatible with Windows ≥ XP SP3 computers, 32-bit or 64-bit. i4xx cards easily plug into a 4, 8, 12 or 16 slot card cage that communicates with Windows computer via high speed USB. i51x wiring boxes easily attach to instruNet products. 8channel direct-to-sensor data acquisition system in the world. Why Is instruNet Better Than Other Systems ? instruNet is the highest-accuracy data acquisition system for performing low-level measurements (e.g. ±100mV) The instruNet card cage does not contain a noisy processor, which makes it easier to do accurate low level measurements. Low level measurements are required by many sensors, such as thermocouples, strain gages and load cells; which respectively measure temperature, bending and weight. 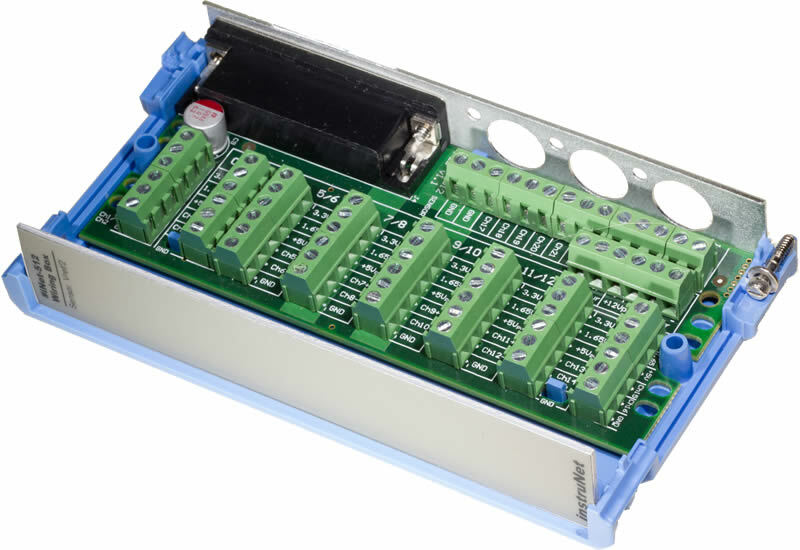 instruNet is the lowest-cost data acquisition system with UNIVERSAL inputs Universal inputs support the direct connection to common sensors, sometimes with the help of one additional shunt resistor. instruNet does this at $124 per-channel with an 8-channel system, with unprecedented accuracy. 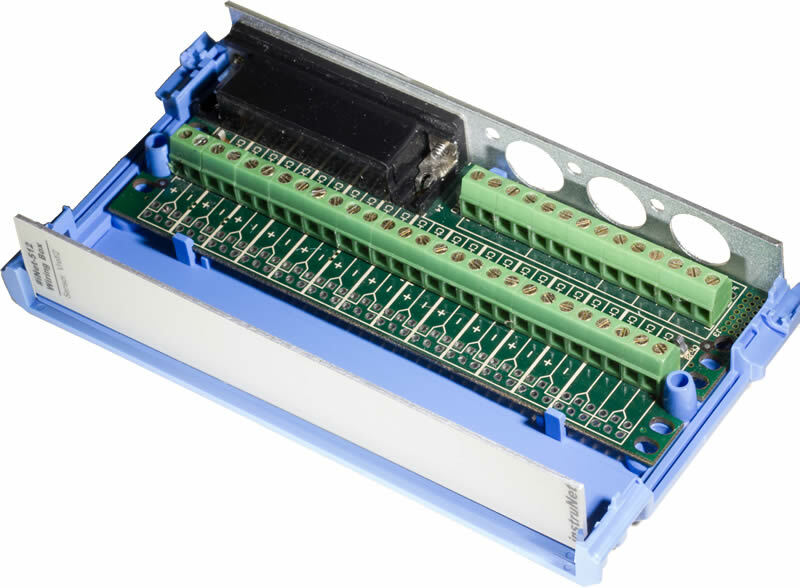 instruNet is the lowest-cost CARD CAGE data acquisition system Card cages enable one to mix and match modules as needed. instruNet is the lowest-cost data acquisition system with optional anti-aliasing filters Anti-aliasing filters eliminate errors caused by high frequencies that enter the digitizer, as explained here. The optional 8-Pole i500 analog low pass filter daughterboard mounts on an i423 card and is ideal for anti-aliasing. For a summary of aliasing and why you might need an AFS filter, click here. The i500 provides extremely low ±0.01 dB maximum passband ripple for Fin/Fc ≤ 0.5. If one uses further oversampling, digital filtering and desampling; then passband ripple is ±0.002 dB for Fin/Fc ≤ 0.8 due to the accuracy of a 30-pole digital filter. 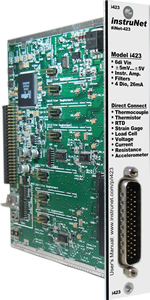 The end user installs between 1 and 6 filter daughterboards onto each i423 card, one per channel. For details, click here. instruNet includes software to interrogate, test, configure, and do I/O with all network channels. This includes an application program called "instruNet World" and interfaces to Visual Basic, C, and C++. instruNet software can configure all I/O channels, store your settings, view digitized data in real time, stream data to disk, and scroll through your waveform post-acquisition. instruNet software runs on Windows computers. Free software and manual updates are available here. The table below shows which sensors directly connect to each hardware product. The numbers in the table refer to number of channels; and if you click on those numbers, you will be redirected to the measurement accuracy for that sensor and product. The following sensors require an external shunt resistor: RTD, thermistor, resistance measurement, current measurement, ¼ bridge strain gage, and ½ bridge strain gage. Thermocouple sensors require an i51x Wiring Box attached to the i4xx/i60x device as noted here. i4xx cards reside in a card cage, whereas the i60x is a tiny standalone device. Below is a list of available hardware products. For more details on each, click on the model number in the below table. i410 The i410 connects Card Cage to Windows Computer via i2x0 instruNet Controller. The i555 includes the following products: i240, i430, i510, i400, i410, i312. i555 Starter System, click here. To learn how to connect a specific sensor to specific software, click here. The i4xx card cage obtains high accuracy by placing the noisy microprocessor in an external box, away from the signal conditioning amplifiers in the card cage; as illustrated below. The below picture shows the i430 card digitizing 0 Volts at a 1K sample-per-second rate on it's +-10mV range with 2.5 microvolts RMS of internal noise (no integration). To further reduce noise, one can digitize more slowly and integrate each point. The below scenario is similar to the above, yet with 16 mSec integration per point at 60 samples-per-second resulting in 0.2 microvolts RMS of noise. The following table shows maximum aggregate sample rates. To calculate the sample rate for each channel, divide by the number of channels attached to the i240/i60x controller. For example, if the maximum aggregate sample rate is 166Ksamples/sec/controller, and you digitize 4 channels, then you could digitize each channel at 41Ks/sec/channel. For more details on this table, click here. One can attach up to four i240/i60x controllers to a computer to increase total system throughput. i51x wiring boxes easily bolt to i4xx/i60x devices. The i510 is the simplest and is included with the i555 starter system. 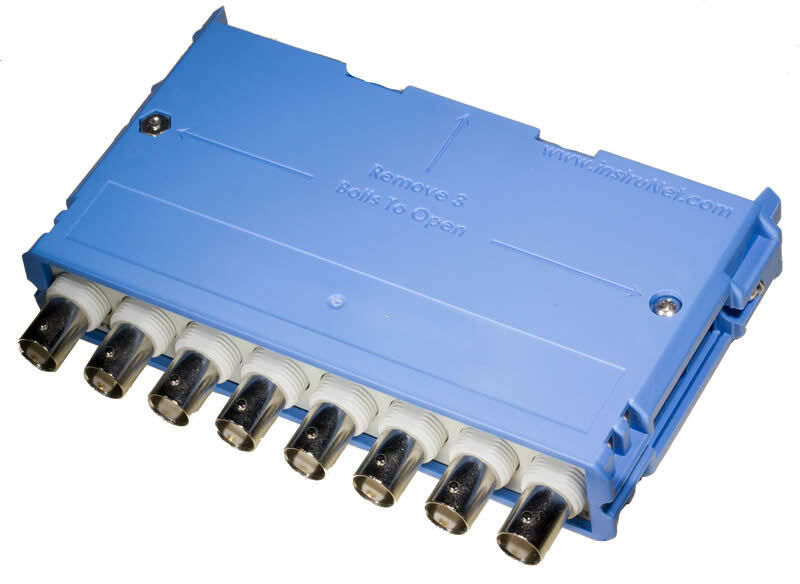 The i511 includes 8 bnc connectors. The i512 has a vRef/2 source that is used to help complete ¼ bridge and ½ bridge strain gage circuits. If you are measuring thermocouples, then the i510 is the only wiring box that will work, since it contains an internal temperature sensor that measures the temperature of the i510 screw terminals. For more details on each, click on the model number in the below table. 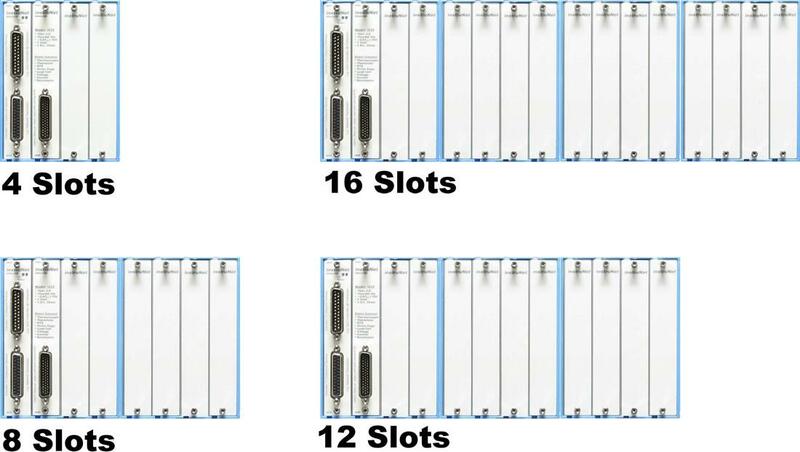 The i400 product provides 4 slots, and multiple i400's can be bolted together by the end user, side-by-side, to create an 8, 12, or 16 slot system. In many applications, one i400 with 4 slots is sufficient. In order to do i4xx voltage measurements, at least one i43x A/D card is required; and only one i43x a/d card is needed for each card cage. Alternatively, the i60x are standalone tiny devices that require no additional components. instruNet i4xx cards are installed by the end user into an i4xx card cage. Each card is 13 x 2.5 x 13 cm in size. instruNet is a low-cost hardware card cage that attaches to Windows computers via high speed USB. The advantage of an i4xx card cage is one can mix and match modules as needed, to build exactly what they need. The advantage of the instruNet card cage is cost. For example, instruNet 4 to 16 slot chassis sell for $100 per slot, whereas comparable chassis are 2x to 4x more costly. The instruNet card cage typically has one A/D measurement module; additional modules provide signal conditioning. The conditioned analog signal is routed to the A/D module via the backplane. This is dramatically different from comparable systems, which place A/D measurement electronics on each module. The advantage of the instruNet topology is cost. After the first module is installed, additional instruNet channels are conditioned at approximately $40 per channel, whereas comparable systems typically cost 2x to 8x more. 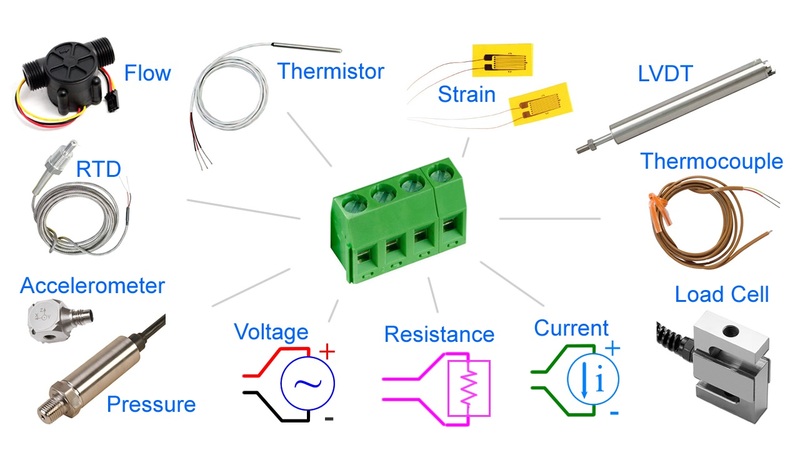 instruNet measurement modules have universal inputs that enable one to directly connect each channel to one of: Thermocouple, Thermistor, Strain Gage, Load Cell, Counter/Timer, RTD, Voltage, Current, Resistance and Accelerometer. Absolute accuracy for all of these sensor types is specified. In some cases, the end user adds an external shunt resistor. The advantage of universal inputs is cost. The optional 8-pole i500 analog low-pass filter daughterboard provides very accurate anti-aliased data at low cost. 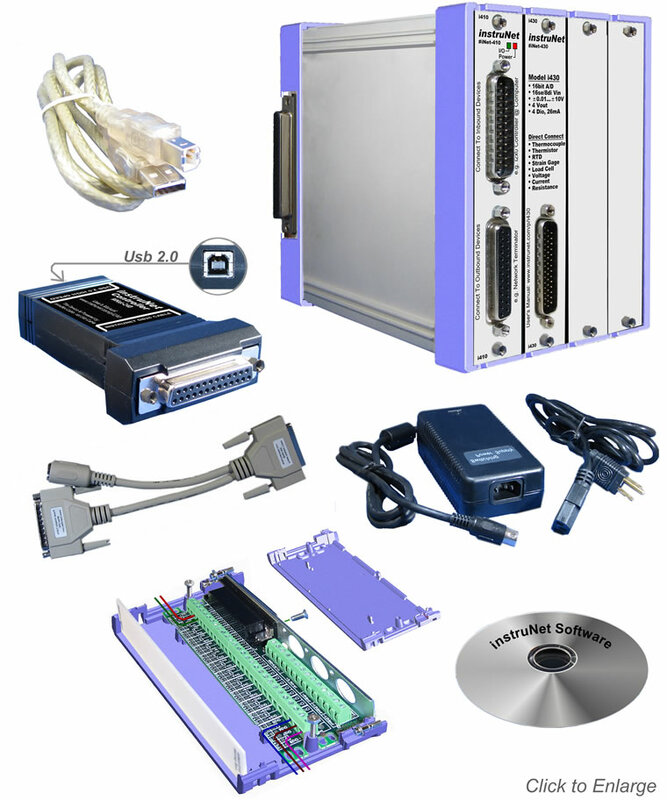 Each instruNet Network is controlled by an instruNet i240/i60x DSP controller device that attaches to a Microsoft 32bit or 64bit Windows ≥ Xp Sp3, Vista, 7, 8 or 10 computer via High Speed USB at 480mbit/sec. Each i240/i60x Controller is an independent computer in itself that utilizes a powerful 32-bit DSP processor and onboard RAM to control all aspects of data acquisition along its network. All real-time tasks are off-loaded to this processor, therefore the host computer is not burdened with real-time issues. Each instruNet network supports up to 4 instruNet iNET-400 card cages.